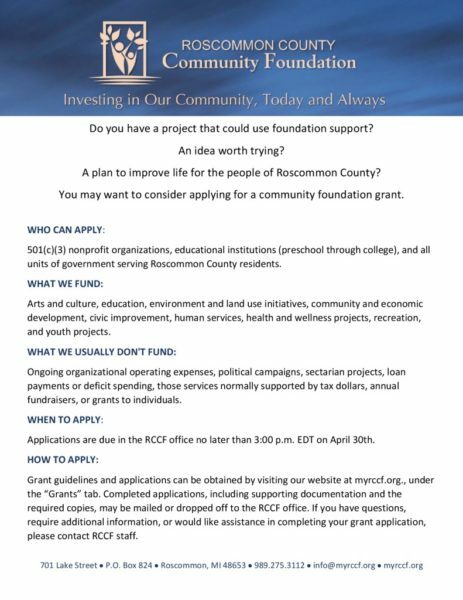 The Roscommon County Community Foundation (RCCF) is pleased to announce its first new Fund for 2013, the Roscommon Historic Model Train Club Building Fund. This Special Project Fund is intended to provide financial support to the Roscommon Historic Model Train Club (RHMTC), specific to the building campaign, which includes but is not limited to the purchase and restoration of the current RHMTC building. restored and used to establish “The Garden Railway” park. The park, which is located next to the Train Depot, features rides for children of all ages. The 1.5″ scale ride-on track layout was completed in spring 2012. This new Fund is now open and accepting donations from the community. To support the Roscommon Historic Model Train Club Building Fund, you may mail a check to RCCF at PO Box. 824, Roscommon, MI 48653, or make a donation online.